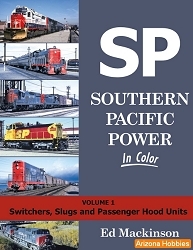 This volume addresses the many different varieties of the GP40 used on the Southern Pacific and Cotton Belt between 1966 and 1996, including GP40, GP40P-2, GP40-2, GP40X and GP40R. TEBU Master Units and upgraded units leased from Morrison-Knudsen are also discussed. 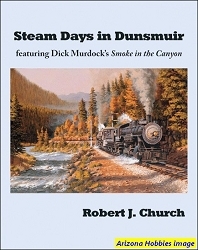 Extensive detail illustration, including late-model signal lights, truck details and early versions of speed lettering. 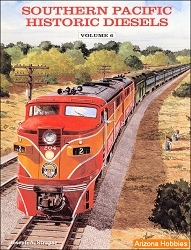 The GP60s displayed some variety too, especially considering that SP owned this model for less than nine years. Early examples featured 'classic' lettering and horn placement (and did without ditch lights), but later units were factory-painted in speed lettering and carried ditch lighting and relocated horns. Shade Tree's usual intensive photo coverage includes as-delivered views, important modifications and painting/lettering evolution. Rosters and drawings are included. 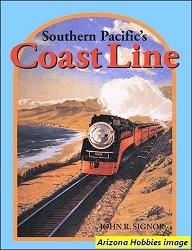 An entire chapter is dedicated to post-1996 illustrations, mostly on the Union Pacific, where many operate to this day. Shade Tree Books, softcover, 128 pages, 8.5 x 11 x .5 in., B&W photographs and roster information.